Cottages for Couples, Distinctive Luxury Cottages for Romantic Breaks in West Cork » NEW COTTAGE WITH PRIVATE HOT-TUB – NOW AVAILABLE – from €99 a night. NEW COTTAGE WITH PRIVATE HOT-TUB – NOW AVAILABLE – from €99 a night. 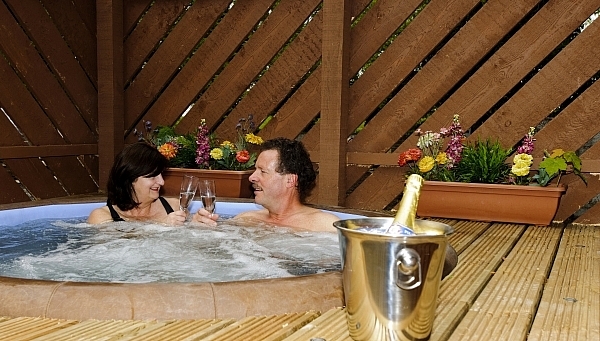 We are pleased to announce our SEVENTH cottage that is now equipped with its own private hot-tub. The BARN AT GROVE HOUSE (click text in red to view) has now been upgraded with the addition of a private hot-tub. Just two steps up from your front door you can now relax in bubbles at 38 degrees underneath the stars as you relax with a glass of complimentary bubbly. With a four poster bed and a jacuzzi suite leading off the bedroom can you ask for anything more romantic. From just €99 a night we expect it to be popular so call 028 22957 to book your stay.